This photo says almost everything I was to say in this post. I am so very thankful for the perseverance God has given me to lose all I did, and continue to keep it off with a healthy lifestyle. I have to say that Christ's love for me---regardless of how much I weigh, my dress size, the size of my muscles, how much I can lift, or how healthy I eat from day to day---stays the same and for that I am most grateful. "Most grateful" seems to be an understatement for Christ's continuous grace on this far-from-perfect sinner, but really, there are no words to describe how grateful I am! I am so thankful that my identity lies in my Savior and not my physical fitness. That takes the pressure off and makes this journey all the more enjoyable! Meet Tara Bialek. She is a gorgeous wife and a inspirational mother of three beautiful kids. She has her own business and on top of that, she takes time each day for God and for fitness. We first met through Instagram. I loved how her love for God glowed through her posts and I enjoyed her HIIT workouts! Recently, I had the privilege of asking how Tara got to where she is now in her fitness journey. Read on and be inspired! When I was in college at the age of 20, I was caught in the college life of staying up too late, partying and being super lazy. I was also lost. I didn't know what I wanted to do when I grew up and felt depressed about the weight gain that I experienced in my first few years there. I remember walking into my favorite store and not being able to fit into the largest size there. I was at a low. I felt like I was in a hole and couldn't get out. I went from being an active athlete in high school to 30lbs overweight and lonely a few years later. After that store incident and a bad breakup I knew it was time to do something. I started walking around campus and eating better. 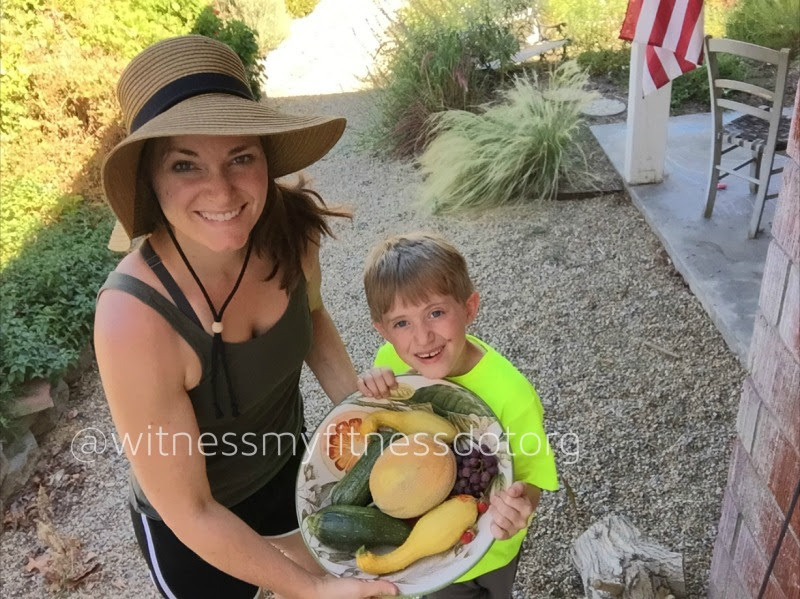 I researched about nutrition and started incorporating what I was learning into my life. I also started doing home workouts like TaeBo and the "OLD SCHOOL" Firm videos. 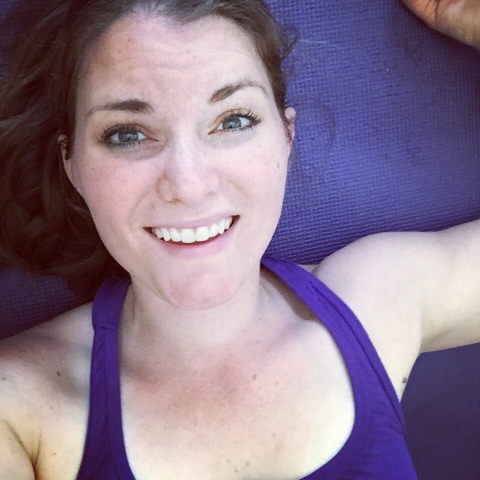 I was too embarrassed to go to the gym, so I did what worked for me. AND it worked. About 6 months later, I lost the weight and was looking into nutrition programs because I was so interested in learning all that I could and helping people live a healthy lifestyle. I transferred schools and got my Bachelors in Nutrition and Dietetics and then went on for my Masters in Education so I could teach! ​My motivation now is my family. I want wellness to be a part of their lives...part of their foundation. I want to live a LONG, healthy life with them and experience every part of life with my family. Before, when I was originally going through my weight loss journey, I was doing it because i wanted to look good. Yes...that's the added bonus of feeling GREAT, but now I do it because it's my time to push myself and get my endorphins going. I feel amazing after and have a totally different mindset for the day. My fitness and the WORD are those things that are a non negotiable for me. They need to be part of my day somehow. God has changed the way I look at health and fitness. It was first all about ME and now its about taking care of the body God has given me, showing others that wellness is important and loving people right where they are. God has given me a platform now to use what I have learned and what He is guiding me to do, to help share His love with the world. My mission, my purpose is to share His love---and what better way to do it then to help others learn to love their bodies and feel good in their skin? Love them right where they are and every step of their journey. How do you include your family in your fitness journey? ​Fitness and nutrition is a part of ​me now. My husband actually now LOVES working out from home with p90x3 and Bodybeast. 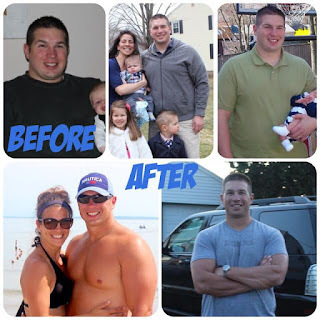 He's totally changed his tune about home workouts and has lost 40lbs! My kids are always joining in and we make "moving" part of our lifestyle. We swim, walk, play outside all of the time, ride bikes together and hike. It's just what we do. I want to make it fun for them! What are your three favorite go-to exercise moves? ​My favorite go-to workouts would be HIIT workouts! I love the high intensity intervals of high knee jogging or skipping (jump rope) for 45 sec and then doing squats for the next 45 seconds, alternating between a strength move and cardio move. The workouts are 30 min and I feel awesome after. I burn a lot more than hitting up the treadmill and lifting after. That's boring to me. I wouldn't be able to sustain that. I actually tried the gym and went for years before I was married and see much better results now from home workouts! How has your view of yourself changed since starting your fitness journey? ​I honestly think the reason why my view of myself has changed is because I am growing everyday in my faith and I see how much God loves me. I find my identity in Him and He thinks I am beautiful. I definitely struggle with this and have so much in the past but everyday I ​ask God to show my how He sees me. I don't ever want to find my true identity in what others think of me. If that were the case, I wouldn't be able to share my journey on social media like I do. If I didn't put myself out there and be vulnerable, how would I help people? How would I be doing what God has called me to do? God is stretching me and showing me how GREAT His plan is for my life so everyday I renew my mind with His promises and how much He loves me. That change of focus and mindset is what drives me to be healthy and share it! If you could give one fitness tip, what would it be? I tell my clients that it's so important to CHANGE your mindset in order to create LONG TERM change in your health. They need to see how much they are valued and how amazing they are as they go through their wellness journeys. I always recommend a book like the Compound Effect or Crash the Chatterbox (depending on their faith) to help them on their wellness journey. Changing your MINDSET is the most important tip that most people leave out of the fitness equation but if you don't....chances are you will never believe you are worth it and you won't give your health priority over most things in your life. 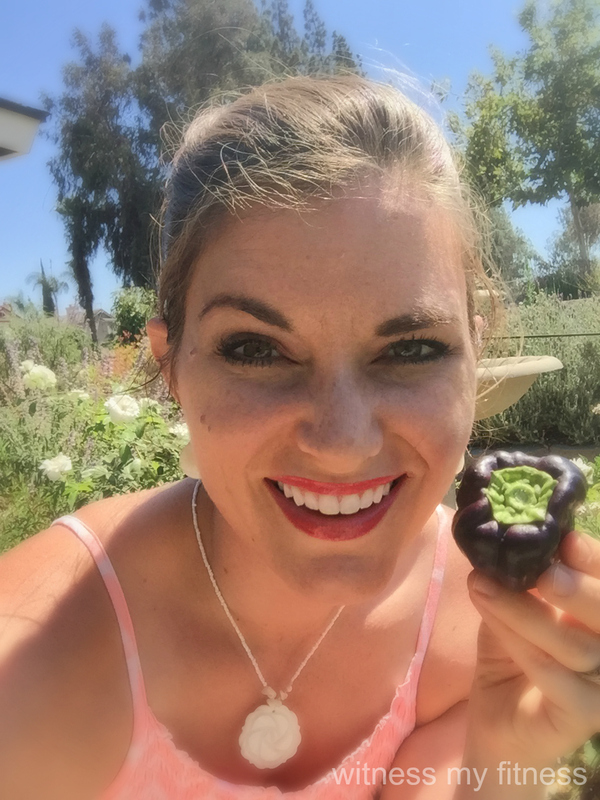 If you'd like to see what Tara is sharing to inspire others on social media, you can follow her on Facebook here, or you can follow her on Instagram here. 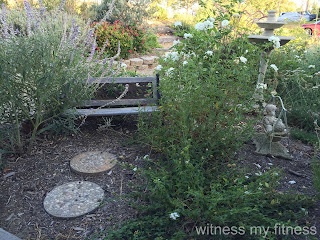 I've had this blog for 7 1/2 years now and I've never shared my love of gardening. That is just a shame! I've been gardening in my backyard for about 3 years. 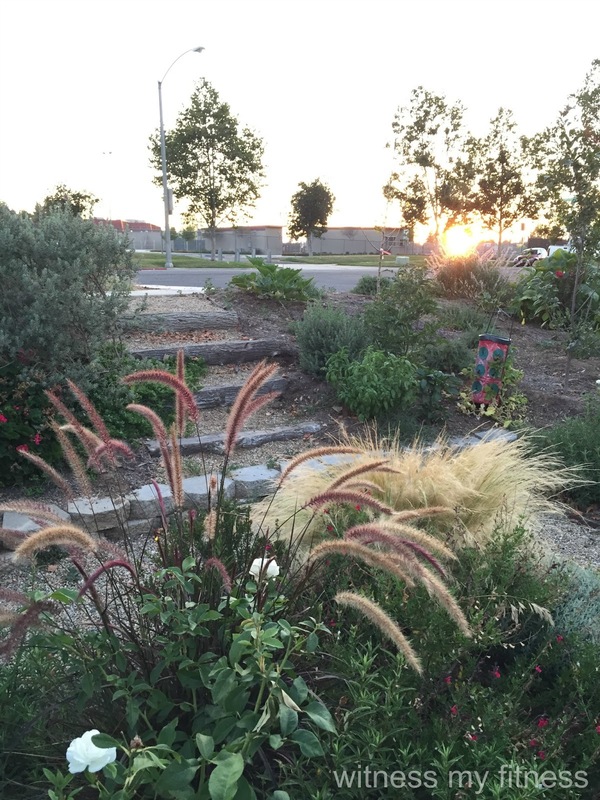 Last fall, we took a huge step and turned our not-so-nice front lawn into a front yard garden. It was a huge amount of time and effort, but it was absolutely worth every bit of it! Everything in my front yard garden is now on a drip system that is saving us money, but we get a beautiful garden that produces food and beauty for us instead of a lawn that never looks good. I'd say that is a pretty good deal! Our family chooses to buy organically what is called "The Dirty Dozen." Most other things we buy from our local farms, which we are very blessed to be surrounded by. These farms are cheap and, although they are not officially labeled organic, they are organically grown and pesticide free. Cheaper than buying any of this produce, though, is growing it! In our entire yard, we are currently growing (most of which are producing or will produce soon) crookneck squash, zucchini, five varieties of tomatoes, seven varieties of bell peppers, two varieties of blueberries, several varieties of cucumbers, two varieties of strawberries, Bartlett pears, Fuji apples, Pink Lady apples, red grapes, Hass avocados, tangerines, two varieties of peaches, Mandarin oranges, navel oranges, lemons, limes, Santa Rosa plums, apricots, watermelon, cantaloupe, sage, rosemary, dill, cat mint (cat nip), lavender, artichoke, onions, garlic, lemon mint, and spearmint. Most of those plants and trees are actually in our front yard. The cheapest way to organically garden is to grow from seed. However, this year both Costco and The Home Depot had organic plants for very cheap. I did find than some of these plants carried blight, a disease that is very contagious among tomato plants and must be disposed of. 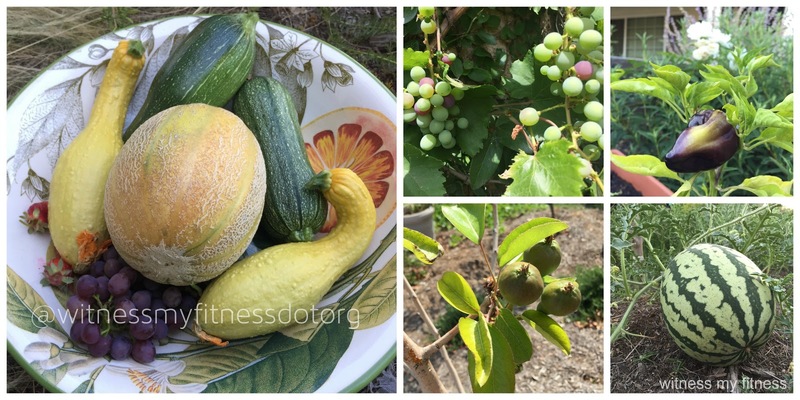 I threw away three plants because of this, but our fruit coming from the other plants has still outweighed our cost. The price of seeds and plants, and even the minimal water used from the drip system to water these food-bearing plants doesn't come close to the fruit we see come from it. It truly is a frugal way to get food. This is just a part of the process of converting our yard from not-so-green grass to a beautiful, water-wise garden. 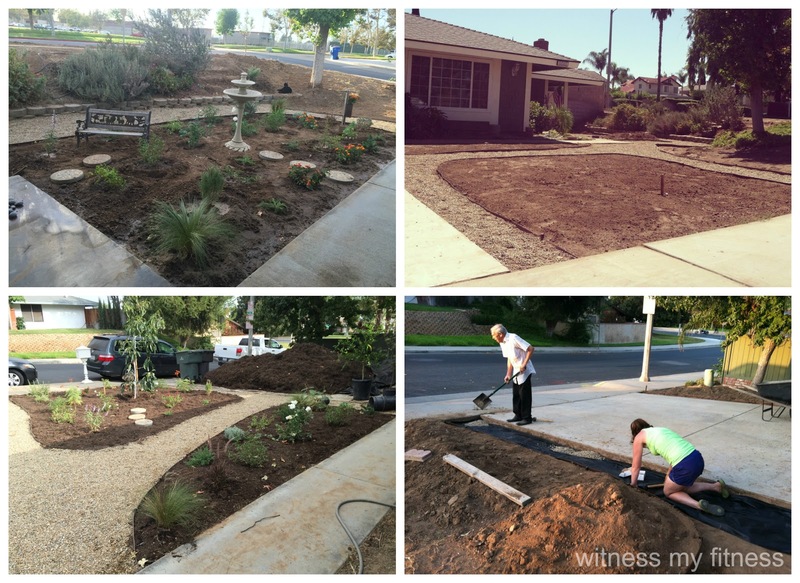 In the lower right photo, I am laying rock with the help of my 78-year-old neighbor. Whenever I was outside working, he was faithful to come and help, despite me verbally worrying about his physical condition. He taught me all about laying and repairing pipe! He was such a blessing in this process! Now, back to the subject of rock. I laid about 7 tons of rock by myself. My hubby got to help with some, but, during the workdays, I plodded on, determined to get our yard done! That, by far, was the hardest I ever physically worked! Core workout, anyone? 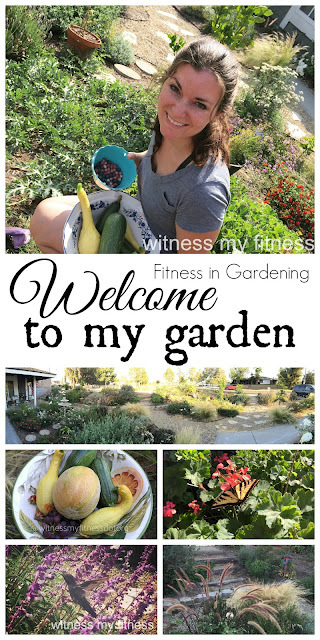 How does all this gardening fit into fitness? Well, aside from the nutrition we get from all we grow, it is physical work! Some may not enjoy this kind of work, but I actually enjoy trimming my plants, deadheading the roses, pulling the "occasional" weed, and, of course, picking our harvest. Then there is the heavy occasional labor like hauling plants, digging holes, trimming trees, and moving soil! A garden is living, and therefore you have to actively attend to it. It is work, but it is work that helps keep me fit and feeds me good food, so it's a win-win! "Mom, when I grow up, I'm going to teach my kids how to garden because you taught me to." This garden-loving mom just about had her heart melt to the floor! As a homeschool teacher, I can teach about nutrition, gardening, science, and nature all through my front yard. Since putting in the nearly 200 plants that make up our front yard garden, nature comes to us. We released lady bugs in our yard several months ago. They've made themselves quite comfortable eating aphids and are still in our yard. We get lizards and birds (although our cat keeps close watch on them! ), beetles of all kinds, butterflies and dragonflies, moths, and praying mantises. My children love to see all of this right outside our front door. 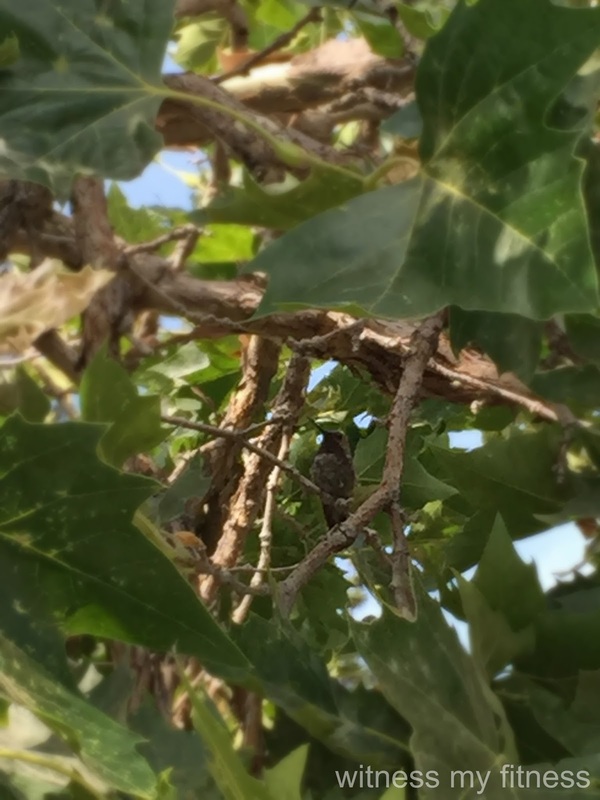 Meet "Zippy," a hummingbird who watches over our yard! One bird in particular has found his way into our yard and our hearts. He (we think!) is a very territorial hummingbird. He chases any other birds out of our yard, and perches himself in a tree or on our tomato cages and just sits and watches. He comes close to us without flying away. We can watch him dart and dash through our yard, protecting all "his" sweet nectar-bearing plants. Because he made himself at home and claimed our yard as his own, we decided we would name him! One of my sons wanted to name him,"Dusty" while my other son wanted to name him "Zip." I just combined the names and so we call him "Zippy!" I am so pleased that my kids get to experience nature on a whole new level compared to a lawn. They get to observe how things grow, if they bear seeds, change color, or smell a certain way. The education from our yard seems limitless! What a way to enjoy God's creation! Left: "Zippy" the hummingbird enjoy nectar from our Mexican Sage. 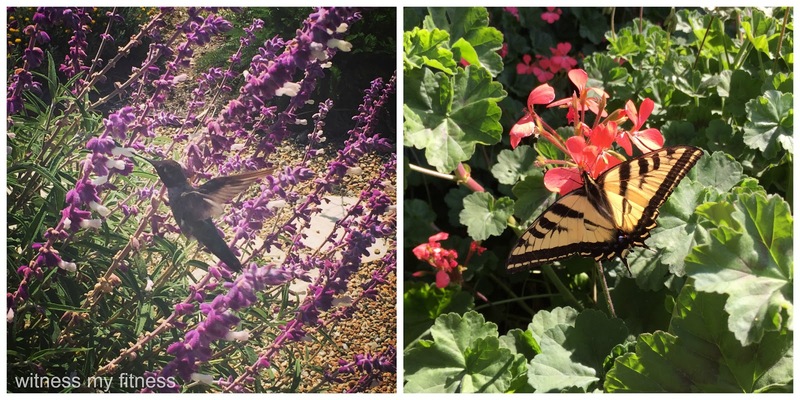 Right: A Swallowtail butterfly enjoying our geraniums! "Consider the ravens: they neither sow nor reap, they have neither storehouse nor barn, and yet God feeds them. Of how much more value are you than the birds!" The Bible so often uses nature to describe the glory and works of God. What a blessing to be reminded of that in our own front yard! This is the bottom and main part of our front yard. The stairs lead to an embankment of land that we also transformed with pathways, fruit trees, and water-wise plants like lavender, a butterfly bush, and lantana. Almost everything in our garden that is not a plant, mulch, or rock, has been so kindly donated by neighbors and family who cheered us on as we worked months in our yard transforming it into a garden. This child-sized garden bench and stones were donated by a neighbor who's grandkids had grown too big for the bench. The figures of the children on the swing was my grandma's, and the fountain bird bath was given to us by my mother-in-law! Now that is what I call frugal! This is our outdoor/indoor kitty named Olive. Since we've converted our yard, she's been busy keeping birds, lizards, and gophers away from our plants. When she isn't busy doing that, she is soaking up the sun! The steps in our garden were actually a diseased Liquid Amber tree and another tree that we had to cut down. We repurposed them as steps by cutting them into the sizes we needed for each step. We cut a flat end and left that at top, while we dug into the ground so the rounded end would stay put. We made sure each log step stayed in place by metal pipes cut to size. I originally wanted railroad ties for our steps, but in doing a little research and having Home Depot tell us that they can't be cut or handled by their employees with out long sleeves and chemical gloves, I decided that wouldn't be the best fit for our organic garden! Although this purple pepper looks great, it was bitter. Any tips for sweet peppers? Thank you for letting me walk through my garden with you! 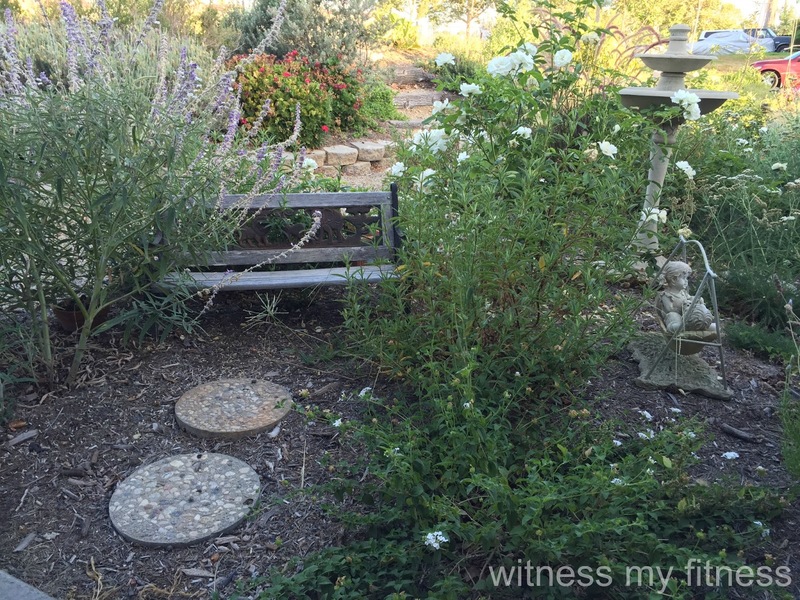 Do you like gardening or does the thought intimidate you? I hear so many people tell me, "I don't have a green thumb!" And to that I must say that my thumb isn't naturally green! It took practice and trial and error to grow anything! I'm still learning and will always be learning! That is most of the fun! It's the first week of Summer. The kids are out of school. Now what? Before your kids start saying the most common, "I'm bored!" complaint and beg to watch TV, take a look at this list of activities to keep them and you fit during the summer! 1. Scooter ride. For youngins, the three-wheeled Radio Flyer scooter is a great way to make it possible for them to participate in this! 2. Bowling. Bowling is a pretty cheap family outing, and you get a core and arm workout at the same time! Many bowling alleys offer deals in the Summertime or during the daytime. 3. Morning or Evening Jog. For the little ones, put them in a jogger stroller and roll on out! For the ones 5 and up, they can run along side you. Walk when they (or you) are tired and then start jogging again when you catch your breath. Running in the early morning or late evening can help your family keep a little cooler on those hot Summer days! Be sure to bring water with you! 4. Backyard obstacle course/workout. Be creative with the obstacles! This activity can be free when you use things you already have. Check out my post on how to set one up here. 6. Bike Ride. The young ones can ride in a trailer at the back of your back or a seat in the front. You can find cheap bike trailers on Craigs List. Ride to the park in the evening and have the kids play on the playground once they get there. They might just sleep in the next morning! 7. Skating Rink. Go retro and teach them how to skate. There may be a lot of falling on your their part, but it's guaranteed fit fun! 8. Run through the sprinklers! This is a good, old fashioned way to stay active and cool. Although, with droughts in some states (i.e. California), be sure to check to see if your city or area has restrictions on what time you can turn on sprinklers. In my area, we cannot turn on our sprinklers between 10am and 6pm. 9. Workout DVD with parents. In the cool of air conditioning, you can pop a DVD in the player and let them join you. Cardio can be easy for them to catch on! 10. Swim lessons and/or a going swimming in a pool. Go in the pool with your kids. It's way better than just sitting and watching them and it keeps you both active! 11. Mommy or Daddy and Me Yoga. Lay out a few yoga mats and teach your kiddos how to do the downward dog or the cobra. Many yoga moves are pretty easy, teach coordination, and the kids will love to mimic animals! Try these kid-friendly yoga moves from Parents.com. 12. Go on a hike. The cooler Summer evenings are perfect for hiking! In our area, we have a few hills we like to hike up. Look up if there are any waterfalls in your area to hike to! If you live near a lake, river, or the ocean, those are wonderful destinations to hike or walk to! 13. Go "Mall Walking." My first job was in the mall and in the Summer, the mall opened it's doors an hour before the stores did. The Mall Walkers would come in every morning faithfully, and beat the heat with the AC in the mall. The best thing about this is, you can treat your kiddos to a morning smoothie from Juice It Up or a frozen yogurt after you do some rounds in the mall! 14. Water balloon toss/fight. You and your kids will be getting wet and running to avoid getting hit. Fun and active... and almost free! 15. FREE workout videos for kids on YouTube. Take advantage of YouTube. It is a great resource for kid-friendly workouts. Click on this link for a fun, free, kid friendly workout from Fitness Blender. 16. Run through the water fountains/splash pads at local parks or shopping centers. The drought in California has limited our city's water use, so all the public splash pads are sadly closed for the Summer. I have found that privately owned splash pads in shopping centers are still running. 17. Lawn games. This rubber horseshoe set is a cheap way to have a fun, active evening in the backyard! Lawn darts are fun as well! 18. Include your kids in your exercise routine. Whether you do CrossFit, weightlifting, BeachBody workouts, cardio, or HIIT workouts, your kids can participate. Just be safe. 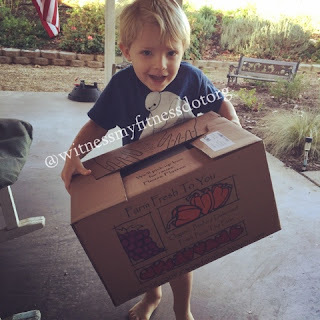 No heavy weights for kids! There are barbell toy sets for kids, but I would recommend them just mimicking your moves if they are very young, or doing 1 or 2 lb weights if they are a bit older. 19. Indoor climbing gym. This is an amazing upper body workout. It's no wonder mountain climbers end up on American Ninja Warriors! These places usually run deals in local coupon magazines. Check your "junk mail" for these deals! 20. Family dance party. Put on some fun music and boogey on! This is honestly one of my favorite memories to make with my kids! You can do it in the backyard if it's cool enough or in the coolness of the AC in the living room. 21. Build a fort on the lawn or in the living room. Include your kids in the process. When you are done, enjoy the fruits of your labor by enjoying a healthy snack or meal in the fort. 22. Sunset "field day." Take your kids to a field at a park or a local public school at sunset. Enjoy the coolness of the summer evening and run around, kick around a soccer ball, do relay races or sprints, or throw a football! How does your family keep active in the summer? If those ideas aren't listed here, please leave those ideas in the comments! Have a happy, active Summer! It has been three years since we were able to take our first "after" photos. In those three years, my husband and I have continued to face the challenge of staying fit as a marriage couple. I'm sure this could apply to any couple, but because marriage is where I am coming from, that is what I am going with! For the most part, my weight stayed the same until a year ago when I had surgery and had to recover from that, restricting me from any exercise. I then was busy with projects, and due to the physical toll that took on my body, I got sick and stayed sick for three months. This is also when my husband's weight went up. What does this tell me? When I am fit, he is fit. We keep each other healthy. This could put a lot of pressure on one spouse or the other. 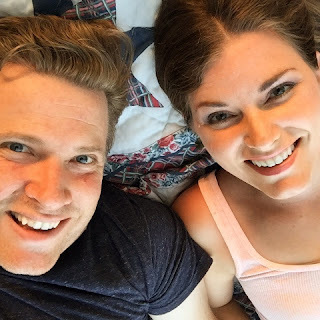 You could look at it as an advantage of having a live-in accountability partner who you love so much you would love to see them succeed as much or more than yourself. That is huge! Having a spouse who supports your goals and has his/her own is a must in becoming fit. Now, I have to say (sorry Hubby!) that my husband is not into fitness and nutrtion like I am. The numbers of his macro nutrients don't make him giddy like mine do. However, he has come to realize how good it feels to be healthy and what advantages it plays in our marriage and daily lives. First of all, we have more energy. That could mean that we can get up earlier to pray together, read together, or exercise together. It also means we could have more energy for our kids. We can be a better example of good health to our kids. We can show them what it means to take care of the body God gave us. It causes us to be more responsible and creative with our time. 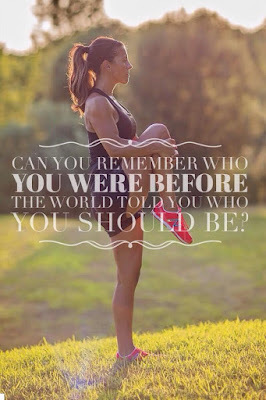 That could mean being creative in how we fit a workout in or being more active as a family. And, it's always nice on our budget to NOT have to buy new clothes because we are growing out of ours! Don't expect you won't gain some weight back. When that happens, stop. Look at how you're eating and how much you are being active. Be honest with yourselves. Are you spending the evenings on the couch with too many bowls of ice cream or *ahem* Schwan's Silvermint Ice Cream Bars? Just because you may have gained 10, 15, or even 20 lbs back does not mean you've fallen off the wagon! It just means your wagon went down a rabbit trail and needs to be steered back in the right direction! And, because you lost the weight before, the chances are, you have an idea of what the right direction is! Make nutrition and exercise doable. Let's face it, most people are pretty busy. Add a spouse in the mix, then kids, or grandkids and you've got yourself many schedules and eating habits to include in your daily challenge to stay healthy. Don't restrict yourself from too many things, unless absolutely medically necessary. (Carb cycling is wonderful for not restricting yourself and still loosing weight, while gaining muscle and health! Read my post about it here!) Don't commit to an hour at the gym if you can't. Don't feel the pressure of having to go to the gym to workout! Workout at home. Invest in a few weights or research a HIIT program that requires no equipment so you have absolutely no excuse to get out of exercise. Make your nutrition and fitness goals to be an everyday lifestyle change. Something you can do EVERY SINGLE DAY without burden. Hold each other accountable in a loving way, free of nagging. If you seem to be sailing smooth when it comes to your eating habits or exercise and your spouse isn't, don't find reason to criticize. Find opportunity to help. Ask your spouse, "How can I help you be better?" When the opportunity comes to just go out and get a burger vs. cooking a meal at home because everyone is tired and hungry, cook the meal together so it goes quicker. Remind each other of the way you feel after eating a healthy meal at home compared to grabbing a burger in a drive-thru. Always find ways to build each other up and encourage each other, not tear each other down. Tearing down could even mean giving into a temptation together. Be united in your goals to succeed. Find ways to encourage with words while working out or complementing each other when you notice clothes fitting looser. Pray for each other. 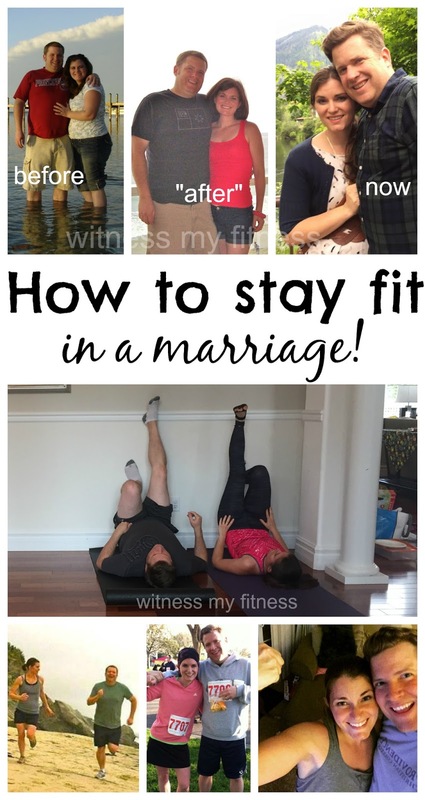 Praying for fitness of your spouse may seem like a small issue. But, Christ says to bring everything to him in prayer. EVERYTHING. Pray together for each other. God hears all His people's prayers. He takes care of the sparrows (Luke 12:24), so why then would we find things in our lives too insignificant to bring to our mighty God in prayer? And finally, just KEEP GOING. There will be periods of time with one or both of you will feel the weight of your jobs, your kids, stress in your life----the weight of the world. There will be days when you can't work out. There will be days when you are sick and a fast food run seems like the only way to get dinner on the table. That is okay. As long as you, as a couple, keep the your goals in mind and know that, even if you are in the place in life where working out or eating healthy doesn't come easy, you can still strive to be the healthiest you can be. Together. I love zucchini. I love basil. I love avocado. Put those three together and, BAM!!! You've got yourself an amazing vegetarian meal full of all kinds of nutrients! This recipe includes sunflower seeds in place of pine nuts, because, really, who has pine nuts in their kitchen on a regular basis? The "Zoodles" are served raw and cool. It is absolutely perfect for a hot Summer afternoon or evening! 1. Cut zucchini into noodles with spiralizer or manodlin slicer. 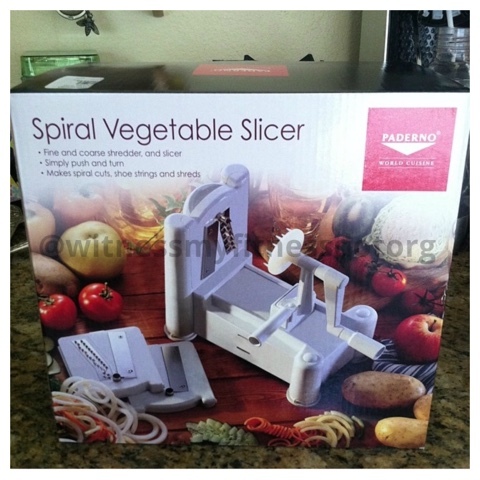 I use the Paderno Vegetable Slicer . 2. In blender or food processor, add avocado, lemon juice, sunflower seeds, basil leaves, garlic cloves, salt and pepper. Pulse until blended, added water as needed for desired consistency. 3. Add zucchini noodles (ZOODLES!) to large, pretty serving bowl. 4. Pour pesto mixture over Zoodles and either get your hands in there and mix it all around or toss with tongs until Zoodles are coated with sauce. Click on photo for link to this great book! Weight Watchers. I've tried it. Counting calories. I've been there. Low carb. I've done that too. 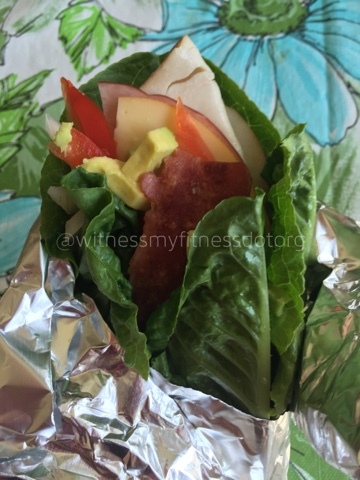 21 Day Fix. Yes, I've even tried that. No sugar. You guessed it! I've tried it too. And of course, the oldie but goodie, the low fat diet. I've been there, done that. 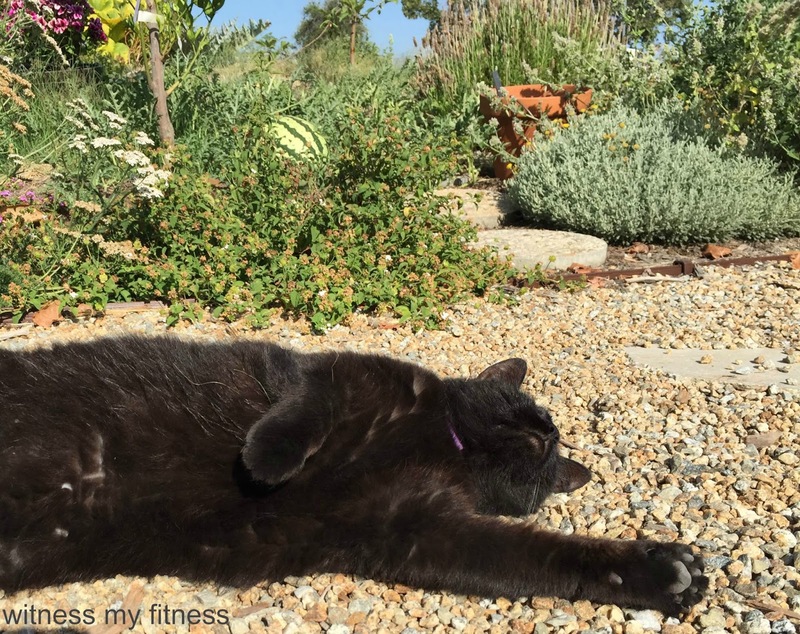 Do you know what all those "diets" or "life style changes" have left me feeling? Deprived. Hungry. Overwhelmed. For the most part, I eat clean. With that said, "eating clean" is a big term that could mean a lot of things, and ultimately, you can still consume things that add to weight gain. For example, raw honey and maple syrup are technically sugars that are "okay" to eat when eating clean. These, however, when consumed in a large amount (i.e. baked goods), even with other healthy ingredients like oats and dark chocolate can add up in caloric value AND they can make my blood sugar sky rocket. After realizing I needed more of a plan than to just "eat clean," I started noticing the term "Carb Cycling" all over social media. People I follow on Instagram, Twitter, and Facebook were following these plans, as well as selling them. All these plans were slightly different and why the planned worked was always explained in different ways. A personal trainer I look up to is Chris Powell of ABC's Extreme Weight Loss. That show is one of my favorites to watch for realistic weight loss and motivation. Chris Powell wrote a book called Choose to Lose: The 7-Day Carb Cycle Solution. I recently ordered the book on Amazon and I just ate it up. Pun intended. I have been looking for a way I can eat that is truly a life style change--- a realistic plan that I can truly stick to without feeling deprived. Carb Cycling is basically eating meals high in carbs one day and low carbs the next. On the high carb days, your nutrients should be lower in fat and a little less protein as well. On the low carb days, your nutrients should be built up of high amounts of protein and good fats instead of carbs. 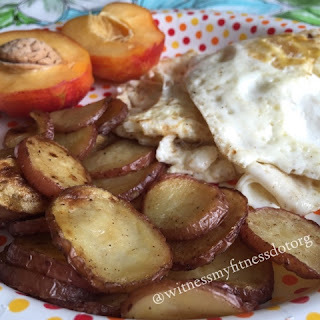 Breakfast on low and high-carb days is always higher in carbs. This is what keeps you feeling satisfied. Let me tell you: IT WORKS! I feel so satisfied on my low carb/high protein days! I've noticed more muscle growth and I've lost 5 lbs in a couple weeks. 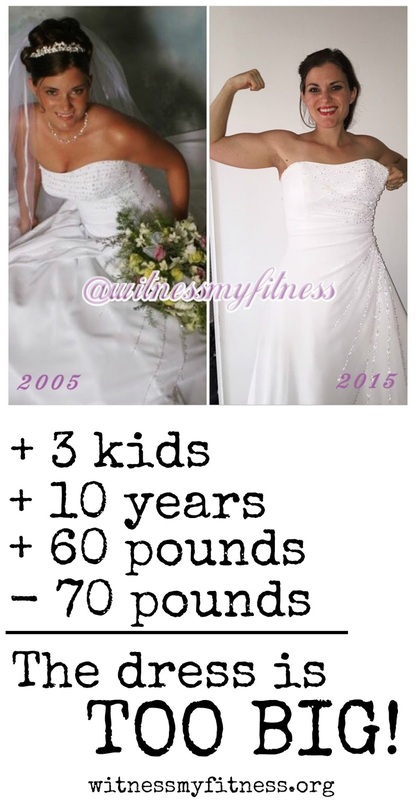 My husband has also lost 5 lbs! I fit into more of my clothes! Did I say I feel satisfied??? I still record everything I eat in my Lose It App, in order to count my proteins, fats, and carbs. As far as calories go, I still end up with enough calories. When counting macronutrients (fat, carbs, protein), it is amazing how that works! This is definitely a way I can eat for the rest of my life. 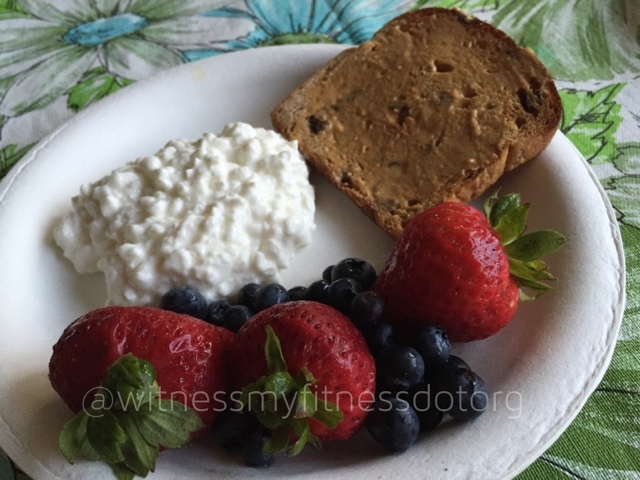 If I am craving carbs (which I no longer do), I can always eat it on my high-carb day. Chris Powell's Choose to Lose: The 7-Day Carb Cycle Solution explains everything from preparing for weight loss and success to trouble shooting social eating situations to what carb cycling is and how to do it. There is a 12 week plan in the book, including a technique every fourth week to prevent plateaus in weight loss. That's right! Preventing plateaus! It get's better... every fourth week, you get to consume quite a bit of carbs! 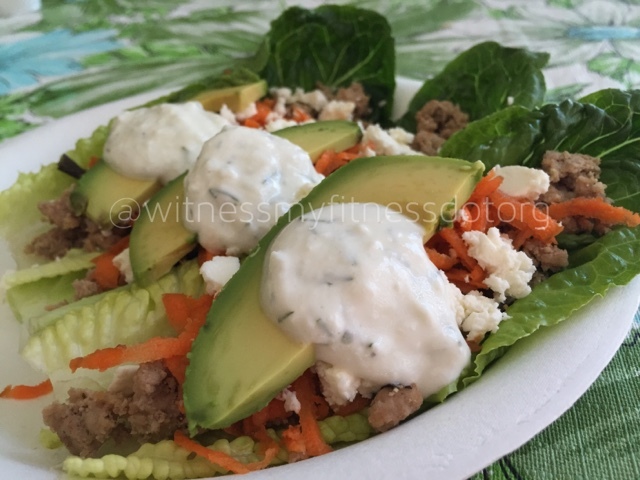 The book includes exercises, recipes, portion examples, shopping lists, low-carb and high-carb food lists, and a quick-start guide if you want to get straight to it. I would definitely recommend Chris Powell's Choose to Lose. It is straight forward, honest, and realistically doable way to live a healthy life style, while losing weight and gaining muscle. Who doesn't want that? If you are wondering what "low-carb" days look like, the photos below are a pretty good example of what I would eat! Wishing you a happy, healthy, doable lifestyle! Peas and Carrots, Faith and Fitness. The look of thankfulness after getting through my workout. Peas and carrots. Peanut Butter and Jelly. Cottage Cheese and Pineapple. Chocolate and peanut butter. Burger and fries. 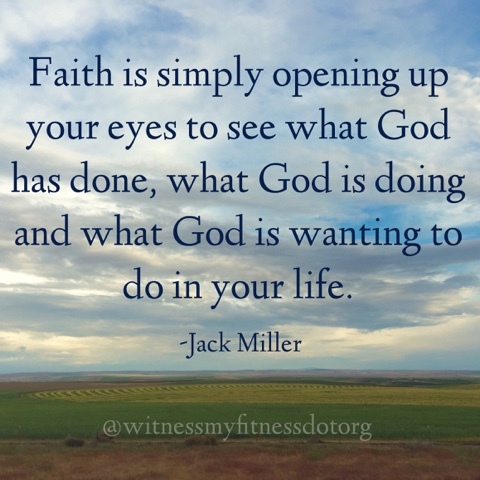 I recently read an excerpt from C. John (Jack) Miller's sermons turned devotions, "Saving Grace." 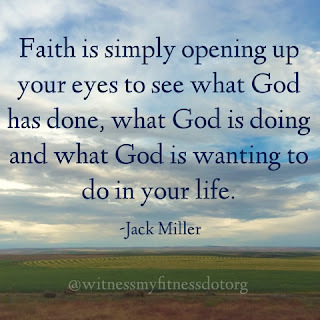 Miller says, "Faith is simply opening up your eyes to see what God has done, what God is doing and what God is wanting to do in your life." I realized very early on in my fitness journey that looking to Jesus regularly concerning fitness was absolutely necessary. In going to God in prayer and giving him my struggles and weaknesses, He graciously, faithfully kept me. He gave me faith to persevere. That faith certainly did not come from within myself. More than 13 years after starting this journey, I am still learning this. "If you want to be really depressed, take an hour and look inside yourself for faith. Now, don't look for faith. Look for Jesus. When you look for Jesus, you have faith." I naturally tend to look at myself and see plenty of failure. Failure to lose as many pounds or inches as I wanted in any given period of time. Failure to not take a bite of that pizza. Or cake. Or donut. Failure to get a workout in. Failure to care too much about what others think of me. If I look to Jesus, giving him the burden of my so-called failures, he lifts those from me and I start to see what God is doing in me. God is giving me perseverance. He is slowly but surely bringing me to my goals...in HIS timing. He is using me to influence my husband, my family and my friends, and help them gain fitness. He is changing my bad habits into good. He is continuously growing me, molding my spirit into what He desires for me. I am so thankful for this man, this partner in marriage, parenthood, fitness, and life that God has blessed me with! To encourage me in faith in the times of abundance and the times of need. "Not that I am speaking of being in need, for I have learned in whatever situation I am to be content. That last verse is used too often without the verses preceding it. Paul is writing to the church in Philippi from a jail cell. Yet, he is saying he has learned how to be content in every circumstance... when he is low and when he abounds. I love how he says he has "learned the secret" to face the times of hunger and abundance in life. That "secret" is Christ. Now this doesn't mean if I want to do something, Christ will give me the strength no matter what. It may mean that I am brought low. It may mean my spirit may be broken and he builds it back up again. It means Christ will get us through life, even when it isn't going as we planned it, as we want it to. It ultimately isn't about our plans and goals for our life. It's about God's. And learning to be content in that is a life-long process. Look to Jesus in that. That is faith. Even when you are brought so low that your goals are completely out of sight, look to Jesus. When you reach your goals, look to Jesus. In both situations, God is still gracious. In regards to my fitness goals, after gaining ten pounds for the first time in two years, I am back on track. I workout most days of the week and I have started a carb-cycling plan that has put my hypoglycemia in check and has started to result in weight loss and muscle gain. When I think back to those dark days of pain and sickness I was in during the first three months of the year, I am so very thankful for God's graciousness in giving me the physical strength to get back to where I am now, but mostly I am thankful for Him faithfully keeping me, giving me faith and perseverance when I needed it most. That, my friends, is why faith and fitness go together, well, like peas and carrots! May God Bless you with faith and perseverance when you are brought low and when you abound in life. 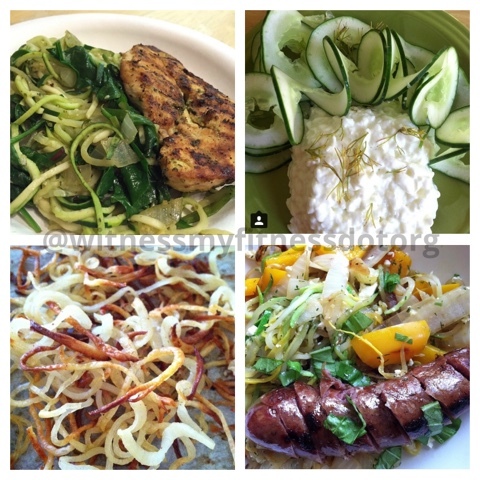 Top Left: Zoodles sautéed with spinach, onions, olive oil, and herbs. Top Right: Spiraled cucumbers for a fun, quick snack. Bottom Left: Baked curly fries. Bottom Right: Zoodles with fresh basil, sweet bell peppers, and onions, served with sausage. One the the most common questions I get from Instagram followers, friends, and church family is "How do you make Zoodles?" The answer is simple. I use my Paderno Spiralizer! This product, by far, is one of my favorites to use in my kitchen. The spiralizer is so easy, fun, and safe to use, my kids run to the kitchen and fight over ask very politely to turn the crank. 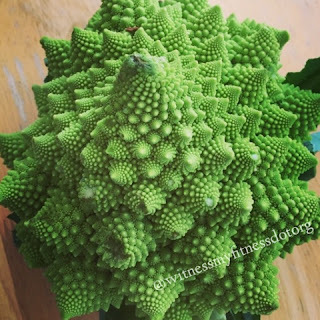 You can make a spiral out of a variety of fruits and vegetables, from zucchini to yellow squash, to cucumbers, carrots, and apples, and, of course, potatoes! We use this tool a few times a week, and, I have to admit, it has prompted me to eat more vegetables. I no longer eat spaghetti noodles because I prefer "Zoodles" over pasta! 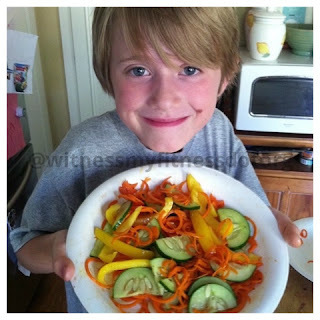 My son made a "vegetable salad" with spiraled carrots! If you'd like to purchase the Paderno Spiralizer and see for yourself how deliciously wonderful it is, please click on the link below! 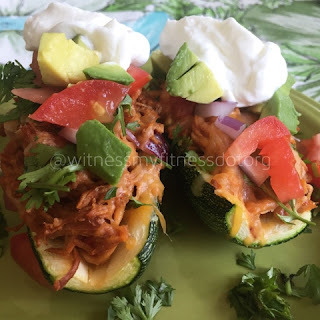 For a website FULL of swirly, twirly goodness, ideas and recipes, please visit this wonderful resource at Twirly Bites! California friends! Have you been looking for a way to get local, organic, decently priced produce delivered to your door? If so, look no longer! 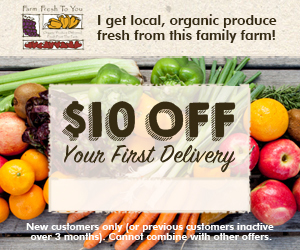 Farm Fresh to You has been growing in California since 1976 and delivers fresh, locally grown, organic produce to your front doorstep. We have been using this service since last year and it has never failed to please the taste buds of my family and I. The best thing (other than being delivered to your door!) about these boxes is that you can customize your box. You don't like eggplant? No problem! Switch it out for nectarines! The site is easy to use. Once you have an account, you can customize your box until two days before delivery. If you are out of town or your budget gets tight, you can postpone your order. A sweet, juicy nectarine and fingerling potato home fries from the Farm Fresh to You Farm Box! My kids love discovering our box on our porch every other Friday! It is obviously by the quality and the taste of the produce that the Farm Fresh to You growers are not only farmers, but artisans. I really wanted a battle rope, so I made one! I just took an old garden hose that I had laying around and wrapped it around a basketball hoop pole. When I need it heavier, I'm going to funnel sand in it and seal if off! Free is the best kind of fitness! Thanks, Pinterest!